This week the S&P 500 Index broke down to the same level it was at in December, 1996. That’s not a correction in a bull market. That’s a crash. We are in a bear market. We are in a recession. The Dow ended down 937.93 points, or 11.72% on the month — the worst percentage drop since 1933, when it fell 15.62%. The Dow industrials have fallen six months in a row and are now more than 50% off their record highs hit in October of 2007. The S&P 500 fell 17.74 points, or 2.4%, to 735.09. Its financial sector dropped 6.5% and its health-care sector sank 4% on fears that President Barack Obama’s reform plans will carve into the profits of drug makers and insurers. The S&P is off 53% from its October 2007 peak and has now seen its worst six-month drop in percentage terms — 42.7% — since 1932, when it dropped 45.44% in the six months ending in June. Yup, that’s pretty bad. Obviously President Obama’s “Not the State of the Union” speech couldn’t save the markets. I suspect it’s because people are slowly realizing that trillion dollar deficits aren’t the solution to anything. Nobody believes that raising taxes on the top 2% of the population will solve all of our problems. And it won’t. But this blog is not about the role of government in society, or about President Obama, who seems like an intelligent, well-meaning guy. Mis-guided, but well-meaning. This blog is about how to make money, and I see only two strategies going forward. Short the market. I am accomplishing this in two ways. First, on up days, I add to my position in RSW – Rydex Inverse 2X S&P ETF, an ETF that attempts to go up by twice the amount that the market goes down. As the chart of the S&P 500 shows, this has been a great play over the last few weeks. Second, I have been gambling with some short options. Note that I used the word “gambling”. Buying options is not investing, it’s gambling, because even if you get the direction correct, your timing must also be perfect or you get wiped out. Therefore I only gamble with a very small amount of money, funds I am willing to lose completely. That being said, I currently own some S&P 500 (SPY) April 70 puts. They closed the week at $3.10; my cost basis is around $2.60, so I have not made a killing yet, but any further market weakness puts me further into the money. Again, this is just gambling, and even if they triple my absolute dollar profit will me miniscule, but it’s fun to play. A better strategy for profiting from the crash, government deficit spending, and the coming currency devaluation and inflation is gold. 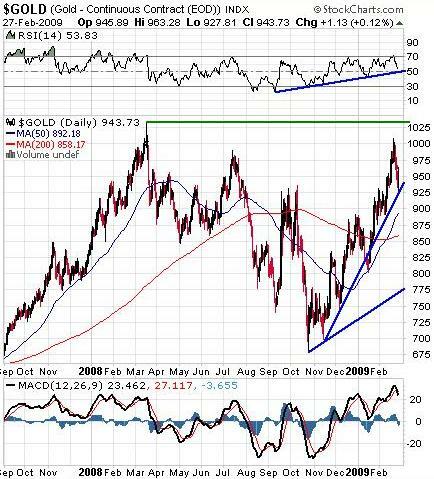 It appears to me that gold could drop into the $875 range and still leave the uptrend intact. Also possible is a drop to the 50 day moving average (currently $892), or the 200 day moving average ($858). Will that happen? Sure, it could happen. On February 14, in my blog post with the shortest title ever, “13“, I said that “I expect some consolidation.” At that time the RSI was up in the 70 range, which generally indicates a pullback is coming. Well, gold has corrected from $1,000 down to a low of $927 on Friday, and the RSI closed at 53.83, so we have had a consolidation, probably due to profit taking. SSO.TO – Silver Standard Resources, Inc. at $22 FILLED (I pulled my bids earlier in the week, and reduced them to $21, bought some, reduced them again, and bought more at $19 on Thursday; it closed at $19.35 on Friday). 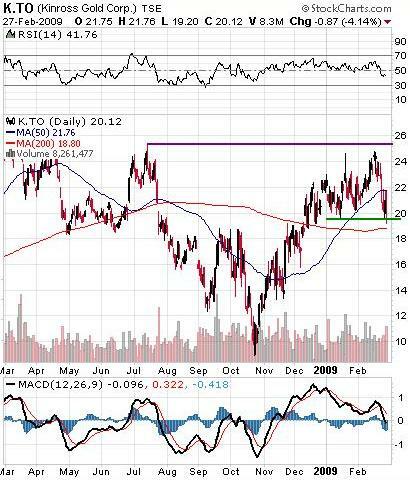 I have my K.TO – Kinross Gold Corp. stink bid place at $20. That looks like a reasonable retracement point to me, but I may attempt to pick up a few shares at $22, to go with the shares I already own, as insurance against a quick spike in gold. More specifically, if I want to ultimately own 1,000 shares of Kinross, and I currently own 200, I may buy another 200 at $22, and then fill in the remaining 60% of my position on down days with my stink bids. Kinross was $10 back in November, and could return there again, but I’m not worried. If it does, that will be an even better buying opportunity. I placed my stink bids at the end of January, and it took until the end of February for most of them to get filled. That’s fine. I can wait. Patience is a virtue. I am now sitting about 30% in cash, but I have another 20% of my portfolio in the RSW – Rydex Inverse 2X S&P ETF, so by selling the ETF I can still have 50% of my portfolio available to be deployed. I expect volatility to continue, so I will continue to pick my spots. Obviously I am not fully invested, so I will place more stink bids, I will not chase stocks,and I will get filled on down days. If we have some dramatic up days, fine, I will thin out my holdings and take some profits. Obviously February was a brutal month on the market as a whole, but being largely in cash for most of the month I didn’t suffer, and I was able to start deploying the cash to build my portfolio to where I want it to be for the spring and summer. 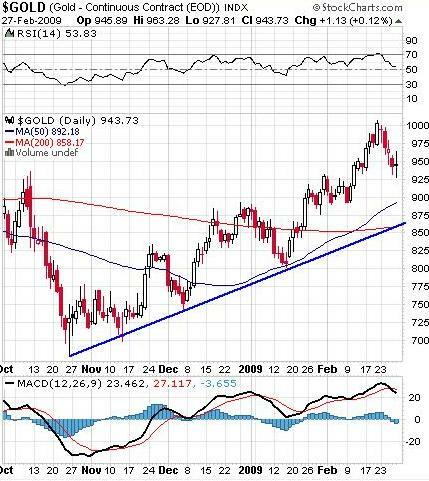 I predicted $1,200 gold by March 31, 2009. That is looking unlikely at this point, but who knows. Of course I predicted 8,000 on the Dow by March 31, and we will need a 1,000 point rally to get there, so these are strange times indeed. A review of everyone’s 2009 Predictions shows that we were expecting gold at $1,026 by March 31, which is looking like a good guess, but we were also expecting the Dow at 9,107, which is looking way too optimistic. I will write a report in a month to see how we did. For now, I will stay the course. I will hold my cash, deploy it on down days, and build towards a higher gold price as the year progresses. It was a slow week on the Forum this week, and that’s a good thing, because we all now have time to stake our positions. Thanks as always for reading, and see you next week.